On January 13th(2019) Dale Renlund, an apostle in The Church of Jesus Christ of Latter-day Saints, spoke at a church-sponsored worldwide devotional for young adults. 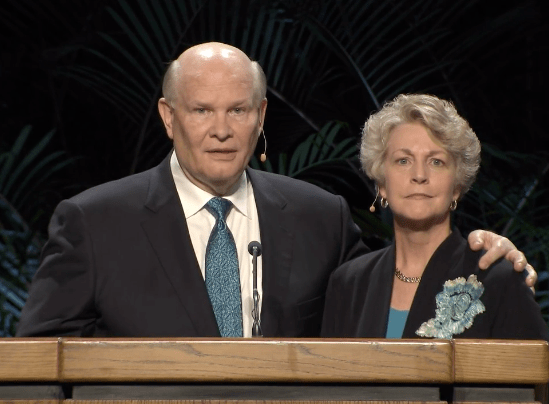 Together with his wife, Ruth, the Renlund’s talk addressed faith and doubt. The overarching theme was centered on the evil nature of doubt, where the Renlunds treated those who have doubts about their LDS faith quite unkindly. They began by sharing a “parable” about a boy who, after being rescued from the sea, became unhappy with the specific rescue provided: the water was stale, the crackers were tasteless, the rescue vessel was old and worn. The petulant boy demanded to be returned to the sea from which he had been rescued. This story was meant to illustrate the foolishness of abandoning the LDS church: “When we lose sight of the big picture, the small dents and peeling paint can loom large in our minds,” Ruth Renlund cautioned. The Renlunds seem to have no concept of the heart-rending and intense anguish Mormons endure as they confront their doubts. The multiple versions of Joseph Smith’s First Vision, Mormon polygamy, Joseph Smith’s behavior toward young girls and other men’s wives, problems with the Book of Mormon, changing revelations, the unsupportable Book of Abraham, the Mountain Meadows Massacre, Brigham Young’s Adam-God doctrine, and a hundred other doubt-inducing questions that challenge a Mormon’s faith are presented by the Renlund’s as a cute but ill-advised “form of church history whack-a-mole.” Those courageous enough (my words) to confront their doubts are mischaracterized as those who choose to be “perpetual doubters.” This view of hurting people in search of truth is heartless. Heartless when the Bible tells us that we are to have mercy on those who doubt (Jude 22). “Remember, the Bible defines faith as ‘the substance of things hoped for’ and ‘the evidence of things not seen’ (Hebrews 11:1). This is why Luke, in the dedications to his Gospel and the Book of Acts, places so much emphasis on eyewitness accounts and ‘infallible proofs’ (Luke 1:2; Acts 1:3). We don’t believe simply because we want to believe. We believe because there are good, solid reasons to believe. And for Latter-day Saints, they must also weigh the validity of Mormonism’s historical claims and doctrinal assertions against those of Christianity. But doing so is not a bad thing. It’s not a faithless thing as the Renlund’s assert. It is what God callsus to do, and thereby we discover reason to trust Him more and more (1 John 4:1). Doubt can’t be a precursor to faith? Try to convince Christian author and investigative journalist Lee Strobel of that. He was an atheist who embarked on a two-year quest to disprove Christianity in order to rescue his newly converted wife from what he believed was a “giant con job.” Instead of disproving Christianity, he discovered that it was true. Lee Strobel now devotes his life to serving God. Doubt and faith cannot exist in the same person at the same time? Try to convince the man in Mark 9 of that. This father brought his demon possessed son to Jesus for deliverance: “‘If you can do anything, have compassion on us and help us.’ [the father said] …And Jesus said to him, ‘“If you can”! All things are possible for one who believes.’ Immediately the father of the child cried out and said, ‘I believe; help my unbelief!’” Jesus delivered the boy and made him well. Doubt causes us to harden our own hearts? Try to convince legendary Christian scholar and apologist C.S. Lewis of that. He left the faith he was raised in and became an athiest at the age of 15. Eighteen years later he abandoned atheism for Christ. He likened his conversion to a “prodigal who is brought in kicking, struggling, resentful…the most reluctant convert of all time.” Later, during the illness of his wife, Lewis began doubting the goodness of God. He kept a journal (later published as A Grief Observed) where his struggles with doubt, grief, and anger were chronicled. But Lewis confronted his doubts, and when he died a few years later, he was a man at peace with God. Doubt leads us to be taken captive by the devil? Try convincing the biblical apostle Thomas of that. Having walked and talked with Jesus as one of His closest friends, after Jesus’ death, Thomas outright rejected the idea that Jesus was alive again. He said, “Unless I see in his hands the mark of the nails, and place my finger into the mark of the nails, and place my hand into his side, I will never believe” (John 20:25). For eight days Thomas doubted or disbelieved – until Jesus appeared and provided the evidence Thomas needed. “Put your finger here, and see my hands; and put out your hand, and place it in my side,” Jesus said. “Do not disbelieve, but believe.” Thomas believed, and as tradition has it, he spent the rest of his life proclaiming the Gospel in India. Contrary to the dire warnings about doubt provided by LDS apostle Dale Renlund and his wife, Ruth, facing faith challenges head-on in a genuine effort to know what’s really true can (and often does) lead to a joyful life of strong and well-grounded faith. True, this would not be faith in Mormonism, but rather faith in the only true God – the God whose gracious and merciful gift to those who come to believe is eternal life in Christ Jesus our Lord (Romans 6:23).